Photo: W.E. Smith House, ca. 1930, 516 Flint Avenue, Albany, GA. 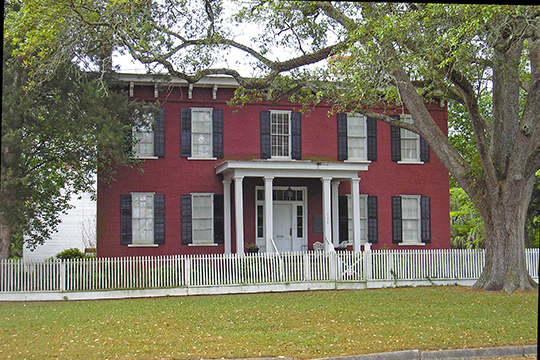 This was the first brick house to be built in Albany City. Listed on the National Register of Historic Places in 1977. Photographed by user:Blastoids (own work), 2015, [cc-by-3.0 (creativecommons.org/licenses/by/3.0)], via Wikimedia Commons, accessed April, 2016. The Dougherty County Courthouse is located at 225 Pine Avenue, Albany, GA 31701; phone: 229-431-2186. The county was established in 1853 from part of Baker County. It was named for Charles Dougherty [1801-1853]. Dougherty was an attorney who launched a failed campaign for the Governorship in 1939.